The Definitive Extra Precision Gold Scale! With gold approaching $2000 per ozt of 24k, the XP500 from GemOro is our extra precision gold scale with amazing accuracy of 0.01g and the best scale for the job! That€™s right, while most scales have standard accuracy of 0.1g, this amazing scale is 10 times more accurate. It even weighs up to one half kilo! 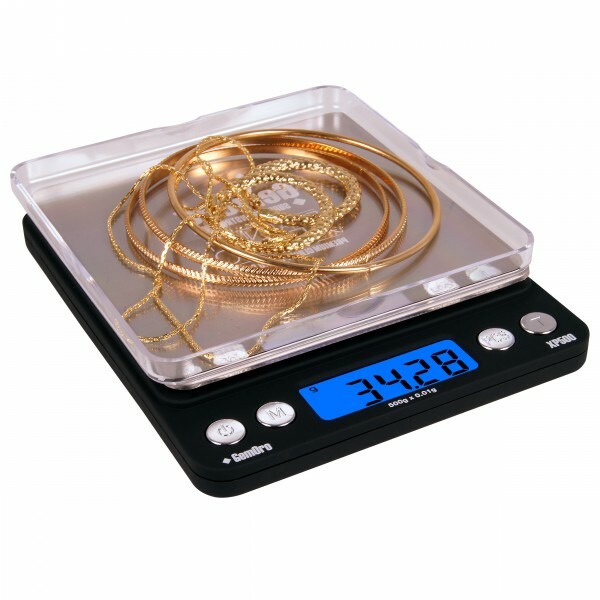 Uncommon on other extra-precision scales, the XP500 has an extra large stainless steel weighing platform too, plus a bright blue backlit LCD display for easy viewing at any angle or time of day. Make every fraction of a gram weight count and put more profit in your pocket and buy the amazing XP500 today!